Bethesda came to Los Angeles ready to knock our socks off, and they delivered. Starting off the show was a bit of a tribute to Bethesda Game Studios and all of the other developing studios that work under the ZeniMax umbrella. Bethesda’s Global Senior Vice President, Pete Hines, then took the stage and proclaimed that this years theme is “Create” and promised a lot of surprises. Next was Andrew W.K., playing his hit song Party Hard with his band on stage. This was a tie in to Rage 2, which uses the song for their trailer. After the song, developers from iD Software and Avalanche Studios arrived to reveal the worldwide premier gameplay trailer for Rage 2, which showed new types of vehicles and combat, including an Overdrive mode where the player pushes their guns to the limit, as well as an RPG mechanic where after collecting “nanotrites” you get a new ability. Rage 2 has a tentative release for Spring 2019. You can also pre order special editions of the game, including a collectors edition with a talking mutant head! After that, Bethesda showcased The Elder Scrolls: Legends, their digital card game. It was announced that the game was relaunching later in the summer with new visuals, and that it was being ported to the PlayStation 4, Xbox One, and Nintendo Switch. Immediately after this was The Elder Scrolls Online, where they announced two new DLC’s for the game, Wolf Hunter, and Murkmire. A trailer for the most recently released DLC, Summerset, was shown which included someone being sacrificed for more power. Next was a big surprise; a teaser trailer which was the worldwide announcement for Doom Eternal, the sequel to Doom. Presented as “Hell on Earth”, the developers promise more demons, more guns, and more power to the Doomslayer. iD Software says they will have a full reveal at their annual convention, QuakeCon, this summer. Speaking of Quake, Quake Champions was next up. Bethesda went into a retrospective of how Quake was there during the beginning of the advent of esports. He then announces that the free version of the game is available to everyone starting tonight. This is followed by a trailer which shows some of the new champions in the game. Prey was next, with the developers revealing three new modes for the game, Story Mode, New Game Plus, and Survival all for free. A new DLC called Mooncrash was announced where you must try and survive an onslaught of alien monsters. Mooncrash is available for download tonight. After this was Wolfenstein, as Machinehead Games announced that Wolfenstein The New Colossus will be coming out on the Nintendo Switch, on June 29. But an even bigger announcement was the worldwide reveal of Wolfenstein Youngblood, which takes place in the 1980’s and you play as Bj’s twin daughters in a two player co-op experience. A teaser trailer was shown after, showcasing the twin daughters and it looks like one specializes in weapons and the other in melee combat. Bethesda is still going forward with VR games, announcing that Prey will have VR in the summer, and a new brand new VR game, Wolfenstein Cyberpilot. Then, at last, Todd Howard arrived. Todd begins with little history of his time at different E3’s and how he’s been working at Bethesda for 25 years. Todd then announces a brand new “version” of Skyrim. The “new” Skyrim was on Amazon’s Alexa, in what was dubbed the Elder Scrolls Skyrim: A Very Special Edition. This was obviously a joke trailer which showed actor Keegan Michael Key “playing” Skyrim through Alexa as well as an Etch A Sketch, a pager, and a Samsung Smart refrigerator. This really shows that Bethesda and Todd have a great sense of humor. Moving on, Fallout 76 was up, and they played the same trailer that was shown in the Microsoft Press Conference. Todd spoke about the backstory of Fallout 76 and then a brand new gameplay trailer showed life inside the Vault itself. The player wakes up and wanders around while the Oversear’s voice plays on a speaker telling that the time for reclamation has begun. The player then exits the vault and enters the world of Fallout. The environment looks astounding, and as Todd explains, the gaming engine has new rendering and lighting, as well as being able to see distant weather conditions on the map. Todd then confirmed what everyone was thinking; the game is online multiplayer. You can party up for 4 player co-op, but Todd assures us that you can still play it solo without any issues. Todd is also fairly honest with how many people we could expect to see in the game at a time. Dozens, not hundreds or thousands. In his words “Its not an amusement park,” and to be fair, he has a point, so don’t go into this game expecting to see a landfill of online players right away. More gameplay was shown, with the V.A.T.S. system and combat being shown first and foremost. The building system returns with even more customization and with the ability to move whatever you build to anywhere on the map. Some new things that were implemented were the emotes and photo mode that you can use when playing solo or with your friends. One of the most dynamic announcements for Fallout 76 was that you can actually take over nuclear missile silos, aim them on the map, and launch them onto a target area. In the gameplay trailer, once the players make their way back to the area where the nuke landed, it has been vastly changed forever. New monsters appear, including a bat/dragon called the Scorchbeast, and the surrounding area is filled to the brim with radiation. 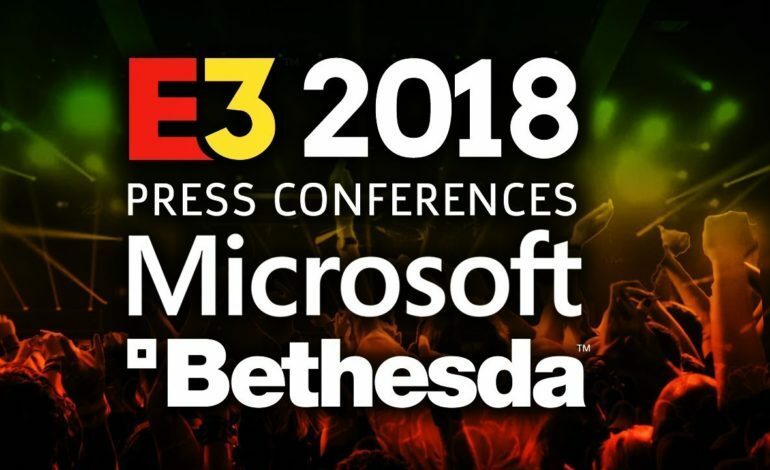 Todd announced that the game will have a B.E.T.A., which stands for Break It Early Test Application, though it is an actual Beta for the game. Todd then revealed that the game will have a collectors edition, and it will included a map that glows in the dark, some Fallout figurines to put on said map, and a actual, wearable, real life Power Armor Helmet. Keep an eye on retail sites to see how fast that pre-order runs out. Lastly, Todd announced that the game will officially release on November 14, 2018. Todd had a couple more surprises in store for us. One of them was the announcement of a brand new franchise, Starfield. All we got was a teaser trailer where we see a space station floating above a planet where it is suddenly sucked into a vortex of light. Then Todd announced what everyone was hoping for, The Elder Scrolls VI. Once again, all we were given was a teaser trailer with a moving camera shot of a large landscape and a coastline, making us wonder where it will take place in the world of Tamriel. Todd bid the audience farewell and Pete Hines came back and thanked everyone to close out the show.